Selecting Mew, from ‘Jet Set Radio’ on the Dreamcast. Despite the relatively short life of the Sega Dreamcast, it had a number of unique and high quality games. 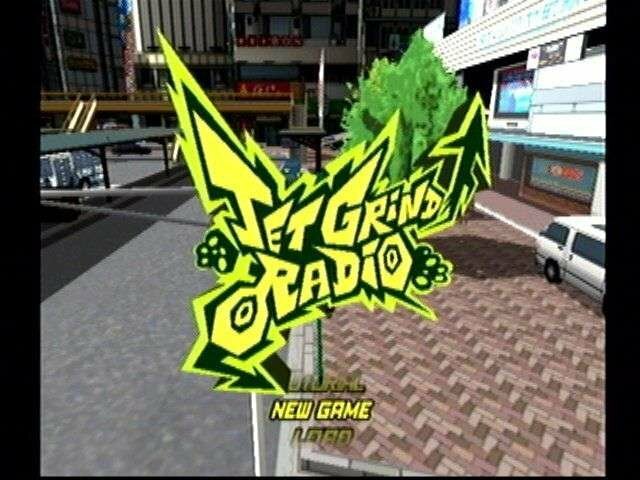 Jet Set Radio, originally retitled Jet Grind Radio in North America for licensing reasons, is one of those games. While it did not sell in big numbers upon its release, it has since become a cult classic. 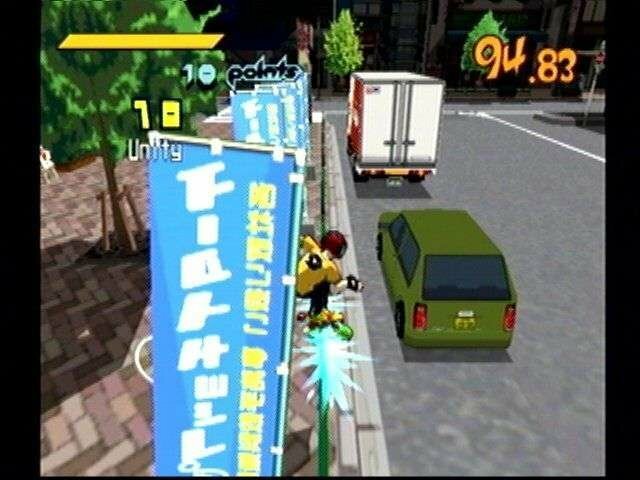 Jet Set Radio had some unique features for the time. It was among the first games to use cel shading which gives the game a unique comic book or cartoon-like appearance. It was also one of the first games to feature an open world setting which was relatively difficult to do on hardware of that era. The gameplay was unique also. As the player you control one of several inline skaters/graffiti artists. Your goal is to tag all the graffiti spots in a given area before time runs out. There are obstacles of course, including police who will pursue you on foot and in tanks and helicopters (seems kind of extreme for graffiti if you ask me). This is very much an arcade style game with relatively simplistic controls. In theme it reminds me a bit of California Games. Though Jet Set Radio was not hugely successful initially and it isn’t really my type of game, it was certainly unique, innovative and of solid quality. Jet Set Radio was initially released for the Dreamcast in 2000. A Game Boy Advance version followed in 2003. High definition versions were eventually released for the PS3, Xbox 360, Windows, PlayStation Vita and iOS and Android devices in 2012. This game is one that is at least worth trying. These days its probably easiest to play one of the high-def ports but the original Dreamcast version is excellent as well. 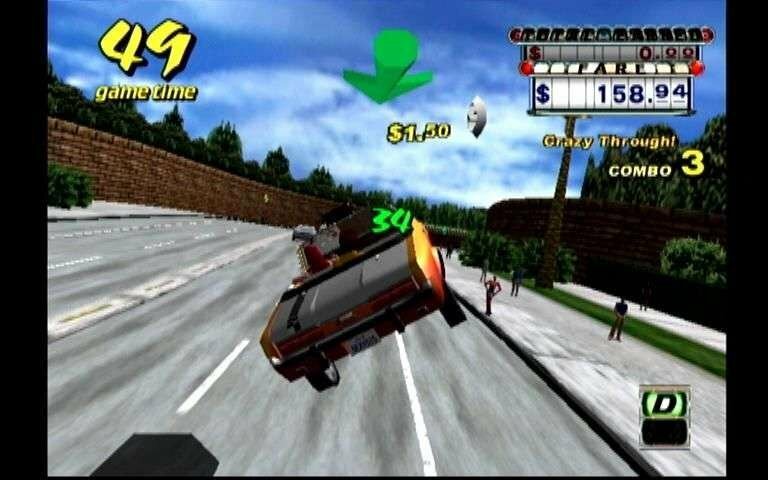 Going for the jump, from ‘Crazy Taxi’ on the Dreamcast. 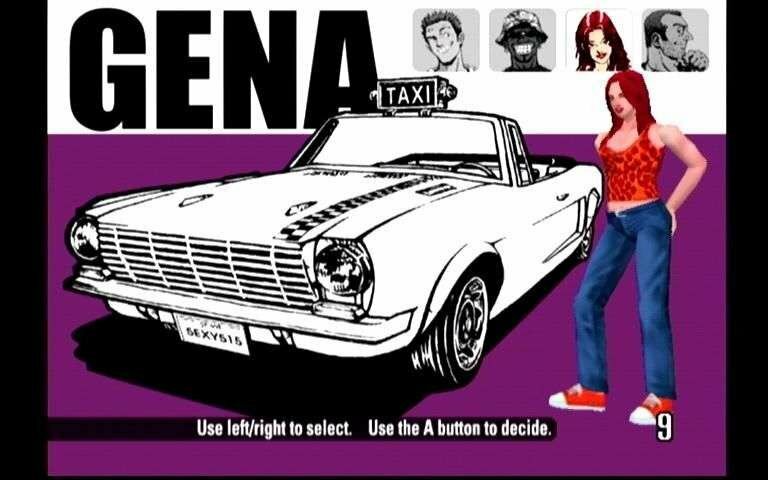 Crazy Taxi was originally a Sega arcade game based on the Naomi architecture which was based on the Dreamcast making a Dreamcast port inevitable. 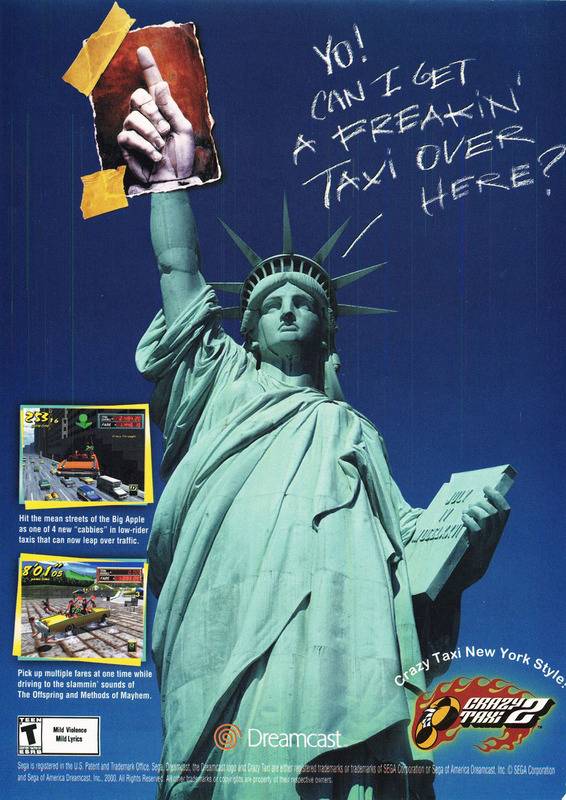 Crazy Taxi was one of the most successful games on the Dreamcast selling over a million copies. The concept is pretty simple. You race around town picking up fares and dropping them at their destinations This, of course, must be done in a limited time frame. You get more tips for doing crazy stunts. The game play reminds me a little of a cross between Outrun and the old Commodore 64 game Space Taxi (though I like Space Taxi a lot better). The game is played from a 3rd person point of view somewhat similar to games like Outrun but in a more open ended environment. 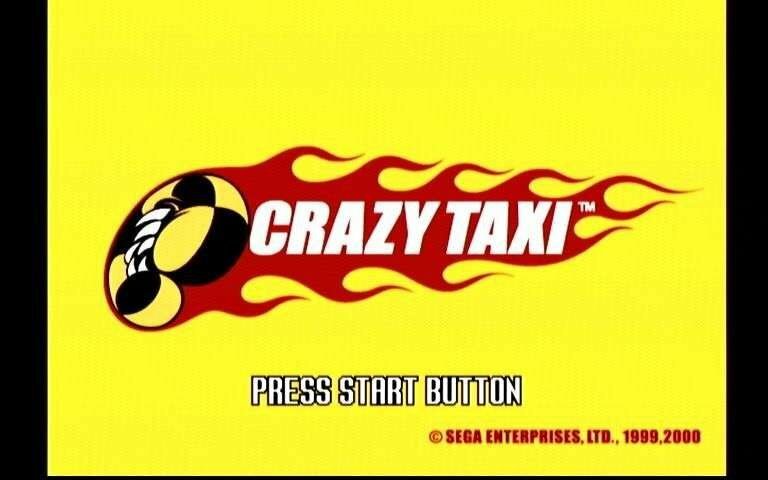 Crazy Taxi was released for the Dreamcast in early 2000. Because Sega abandoned the hardware market, the game was ultimately also ported to the PS2, Gamecube and PC. There have been a few sequels and a couple of spin-offs including the relatively recent Crazy Taxi Tycoon. However, this is more of a business management sim and not at all like the main games in the series. There hasn’t been a true sequel since Crazy Taxi 3: High Roller in 2002. If you want to play the original, it’s hard to beat the original Dreamcast version. However, the ports are ok too. It is definitely a fun game (even if it is not as fun as Space Taxi) as are the two sequels. Crazy Taxi also made it’s way to online services for the PS3 and Xbox 360. If you like this game, in addition to the two sequels, there is also The Simpson’s: Road Rage. This game is so similar that they were sued by Sega for patent infringement. It’s essentially the same game with a Simpsons theme. Images above are from the Sega Dreamcast version of the game. The last three came from Moby Games while the first one was taken from Tumblr.